Nearest: Tube Station: Warren Street 70 yards (64 metres), Railway Station: London Euston 0.3 miles (0.5 km), DLR Station: Tower Gateway 2.9 miles (4.7 km), Motorway: M1 Junction 1 5.1 miles (8.2 km). 6 tube (underground) stations within a half mile circle (0.8 km) , makes this a great choice for transport links. The Radisson Blu Grafton Hotel located on Tottenham Court Road, is an imposing Edwardian building sensitively restored to its original architectural style. This is a central location on the doorstep of the main tourist districts. The hotel is at the northern end of Tottenham Court Road adjacent to Warren Street Tube station. Tottenham Court Road is a very busy main road at all times of the day. Best known for the bargains to be had at the endless number of electrical stores specialising in high tech equipment such as HiFi and computers. There are also several fast food restaurants along the road the Radisson Grafton is located on. Just to the north of the hotel is Regents Park. This is a large are of open space that has an outdoor Theatre and is also home to London Zoo. 0.7 miles to the east is the International Eurostar terminal at Kings Cross and St Pancras station. The area just to the west is known as Fitzrovia and this leads on down to Marylebone and its quaint High Street. A half mile walk south finds Oxford Street and Soho. Oxford Street being one of the must see parts of London. Endless shops and stores, small and large make this one of the busiest shopping streets in Europe. Soho is one of the best area for nightlife, making up part of London's Theatreland and known for its many fine restaurants and its clubs geared towards adult entertainment. Other local places of interest include Petrie Egyptian Archaeology Museum (0.1 miles), Pollock's Toy Museum (0.3 miles), British Library (0.6 miles), British Museum (0.6 miles), Ben Uri Art Society and London Jewish Museum of Art (0.7 miles), Wgmore Hall (0.7 miles) and Madame Tussauds (0.7 miles). The Radisson Blu Grafton Hotel features modern, classical interiors, which create a sense of space and light. The Grafton houses a tremendous collection of art works and artefacts in fact you will find them everywhere. They include a fine temple bell, two Chinese black lacquer ware tallboys and exquisite original paintings by Vietnamese figurative artists Bieh Nguyet and Anh Quan. The hotel is for the most part above a row of shops though the entrance is on the ground floor. Bedrooms are the work of designer Michael Attenborough who has given the rooms a contemporary style while retaining their classical simplicity. The mood is warm but low key with dark wood furniture, and a sense of light and space with bespoke wall coverings, designer Italian chairs and crisp cotton bed linen. Standard guest amenities include advanced telephone system with personal numbers, satelitte TV with pay movies, S 110v sockets, full air-conditioning, mini-bar, iron/ironing board, trouser press, tea/coffee facilities, complimentary WiFi internet access and safe. Bathrooms are finished in Sicilian Marble. All rooms have electronic key card entry. All of the suites have Bose Wave CD systems, specially commissioned designer furniture and luxurious Phillipe Stark bathroom. Deluxe bedrooms are larger than standard and have a king size bed, a seating area and bathrobes. There are 11 bedrooms that are adapted for guests with disabilities. Room service runs 24/7. The stylish and sophisticated Aston restaurant takes its name from being the site of the inaugural meeting of the Aston Martin Club in the 1930's and here you'll find simple cooking, simple food and quality ingredients is the aim. Light and spacious the restaurant serves contemporary British cuisine. Open: 07.00 till 10.00 (Sunday 7.30 till 10.00), 12.20 till 14.30, 17.30 till 22.00. The Aston bar has a large screen TV which shows Sky sports channels. Express check in and check out by request. The hotel has a 24 hour front desk. Currency exchange and laundry valet services available. Hotel offers Mobile phone rental, Limousine hire, luggage storage, theatre reservations and other services via its concierge team. The Radisson Edwardian Grafton offers a business centre and fitness room. There are also 14 meeting/function rooms with high tech amenities and equipment. Radisson Blu Kenilworth Hotel: is 0.6 miles (1.0 km) away, has a guest satisfaction score of 82% and rates start from about £100. Radisson Blu Bloomsbury Street Hotel: is 0.6 miles (1.0 km) from here, earns a customer rating of 82% and base rates begin at about £136. Radisson Blu Berkshire Hotel: 0.8 miles (1.3 km), rated at 81% and with rates from around £149. Radisson Blu Mercer Street Hotel: 0.8 miles (1.3 km), rated at 89% and with rates from around £175. Compared to other London hotels: This hotel has been rated 82% by past guests. The London average is 80% and the average for 4 star hotels is 83%. Therefore although the hotel is above average for London as a whole this hotel is below average for its sector (star rating) . Radisson Blu Hotels across the chain average 83% so this hotel is slightly below the guest rating for most Radisson Blu hotels. Milesfaster ranking: 347th from 866 London hotels, 4th of 13 Radisson Blu Hotels, and 147th of 328 four star rated hotels. 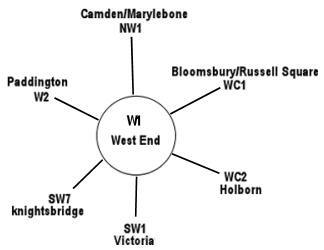 The 51 nearest hotels around this area (130 Tottenham Court Road, W1 postcode) which we have have on our website extend out to a 0.7 miles (1.1 km) radius. The numbers by star rating are 6 five star hotels (average rating 88%), 25 four star hotels (average rating 81%), 13 three star hotels (average rating 77%), 5 two star hotels (average rating 67%) and 2 one star hotels (average rating 62%). Coming out as the top rated hotels is Montague On The Gardens Hotel (4 star) at 99%. For the nearest 51 hotels in the area we have base rate data on all of them. Looking at all hotels in the area the average base rate is £115 per night. They range from a low of £16 at Generator Hotel (2 Star, 77%) up to £340 at Langham Hotel London (5 Star, 95%). Rates break down to the following for each star rating: Five Star average: £266, Four Star average: £116, Three Star average: £79, Two Star average: £42 and One Star average: £53. Using our in-house algorithm we rank hotels based on guest ratings and weighted for related factors. We have a ranking for Radisson Blu Grafton Hotel 14th (joint) of 50 and 6th (joint) for the 25 four star hotels in the area. Our base rate rank for the hotel is 33rd of 51 (14th of 25 four star hotels.). We use the base rate ranking and review ranking for the hotel to get an overall ranking of 18th of 45 for sheer value for money (SoHostel was top). Parking: no spaces onsite. Local valet parking available.